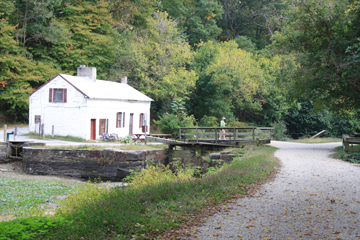 Lock 21, at milepost 16, is named for the house and snack bar formerly operated by the Swain family, which has lived in this area since well before the canal closed in 1924. The area is a popular spot with limited parking. Five campsites are available on the canal side of Swain's Lock. After many years in operating a concession stand at the lock, the Swain family finally left the Swain's Lock facilities in 2008. The lockhouse is under renovation by the C&O Canal Trust and will eventually be available for rent as part of the Canal Quarters program. The lock is accessible from River Road 2 miles west of Potomac Village, Md. Turn left on Swain's Lock Road, .3 miles. A campsite near the lock has picnic tables and portable toilets.